Network Rail has said it will take over track maintenance from private contractors in two further English regions. The move is being hailed by unions as a potential step towards the renationalisation of Britain's railways. But Network Rail, created last year as a replacement for Railtrack, said it was simply trying to develop new ways of managing rail maintenance. Part of that strategy was to do some of the work itself in some locations, the not-for-profit company said. The two contractors affected are Balfour Beatty, which will lose the £80m contract to maintain lines into Waterloo from the South Coast, and Serco, which will lose the East Midlands area. Balfour Beatty was in charge of the track at Hatfield when a broken rail caused a derailment that claimed four lives in October 2000. But Network Rail insisted its decision was not a reflection on the performance of Balfour Beatty or Serco, which continue to carry out work on other parts of the network. Since privatisation, Railtrack and then Network Rail have contracted out all work on track and signals to private companies. But in January Network Rail announced a partial U-turn, and took back control of the line into Paddington from Reading. Explaining the latest move, Network Rail chief executive John Armitt said: "Bringing these contracts in-house will help us to understand the reasons why costs have risen and obtain a clear understanding of the maintenance delivery activity. "Improving the efficiency of maintenance will help optimise our renewals expenditure; the two are inextricably linked." But Bob Crow, general secretary of the Rail Maritime and Transport (RMT) union, hailed the decision as a "step in the right direction". "All other maintenance should now be brought back in-house, along with all the train operators. "We need a unified national railway network because privatisation has failed to deliver that," he said. Thursday's announcement follows the recent agreement in which Network Rail has taken over maintenance in the Reading area from contractors Amey. 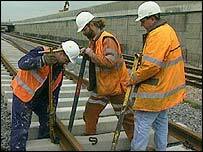 Network Rail also said it would be introducing tough new contracts in an effort to drive up standards. Balfour Beatty shares closed down 3% at 153.5, while Serco was down 6.9% at 114.5p.